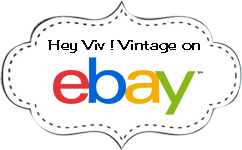 Vintage Auctions on eBay - Hey Viv ! What do you do when things are slow and you need to shake it up? Well. I decided to get back into Auctions on eBay so I could sell some of the vintage that I have had for awhile. This way the vintage dresses, tops, skirts, and jewelry would be seen by a new audience (the auction fans). After doing some research on best days to end an auction and how long it should run I was ready to give it a try. I list about 30 items at a time on eBay Auctions and as soon as some sell I add more. The prices are low but it helps my cash flow and clears out stock. It's a throw back to the old days in 1999 when I started on eBay and ran auctions all the time. This was before Buy It Now on eBay which changed the game for me.